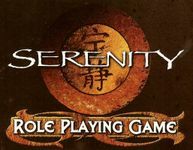 The Serenity Role Playing Game lets you re-create the action of the 'Verse, the unique and exciting science-fiction setting created by writer/director Joss Whedon. Fly a ship out into the Black, take jobs as they come, and make sure you get paid! Related to the Cortex RPG system.